Amnesty Malvern Hills group’s major event for 2010 is a presentation of this important new documentary film, followed by a discussion and public forum led by two former Guantánamo prisoners, Moazzam Begg and Omar Deghayes, and the film’s co-director, Andy Worthington. The date is Tuesday 19 October at 7.30pm, at The Forum, Malvern Theatres. Following on from our successful presence at the Birmingham Pride parade I joined the Amnesty contingent at the Pride London parade on Saturday. Well if you thought the Birmingham Pride was fantastic then this was something else altogether. The number of floats, groups, placards, banners and people taking part was amazing. The Amnesty presence in London wasn’t as creative as the local parade so no fabulous outfits. However, there was around 25-30 committed activists plus unconnected people who joined us, crowds asking for our stickers, placards waving, leaflets being handed out and the fantastic float. 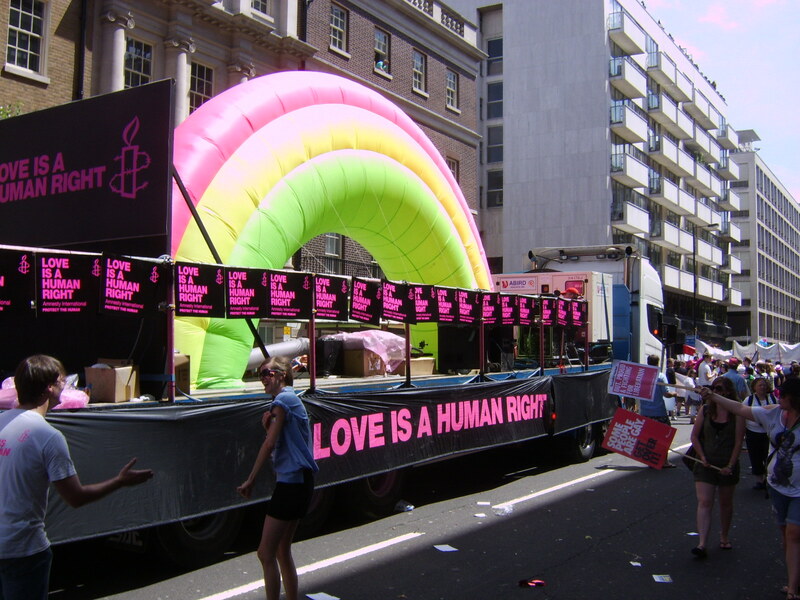 The float had a huge inflated rainbow in yellow, green and pink (see above), placards all over, flags on the rear and a stereo playing around ten songs with love in the title. The people taking part had great enthusiasm and energy. They came from London, Brighton and Bournmouth and no doubt elsewhere too. One interesting difference to the Birmingham Pride event is that because it was an LGBT network organised group those taking part were mainly from the LGBT community but not exclusively. For me the low point was a dignified counter-demo organised by a group of Christians. They held placards suggesting the marchers were lets say misguided but the fact they are able to have their freedom of speech is to be applauded and they were outnumbered by the gay Christians in the parade. In some ways this all reinforced that human rights are for all of us whatever our religion or sexual orientation. Is Baghdad a Safe Place to Return To? Whilst looking around the Amnesty International UK website I noticed that our government is forcibly removing people from the UK to Baghdad and other parts of Iraq. Iraqi national forcibly returned include individuals from Ninewa (Mosul), Kirkuk, Diyala, Salah al-Din and Baghdad, areas considered particularly dangerous and, therefore, “unsafe” by UNHCR (UN High Commission for Refugees). If they are unsafe then why return them now? Why not wait till they are more stable and safe to return to? 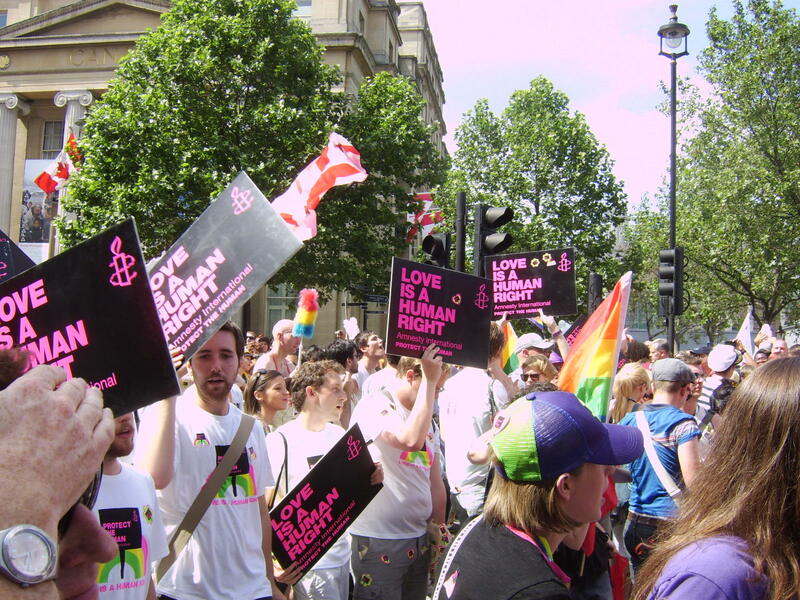 A couple of photos from my trip to London to join the Amnesty contingent at Pride London. Report to follow. Great news! A group of boys from King Edward VI Grammar School, Stratford upon Avon has formed an Amnesty group and is staging an action in support of the Burma Campaign in the Bancroft Gardens, Stratford upon Avon between 3.30 p.m. and 6.0 p.m. on Friday July 9th.They are inviting Amnesty members and the public to make origami boats, sign them with a personalised message, and float them down the River Avon. They are particularly keen to show their support of students Khun Bedu, Khun Kawrio and Khun Dee De who were arrested for peaceful protest. As leading members of a youth group they had organised local dissidents to release balloons, launch paper boats and spray-paint walls with their peaceful political messages. For these simple acts of defiance they were sentenced to between 35 and 37 years in prison.